Sorry Princess Handy is no longer sailing/ not running trips. 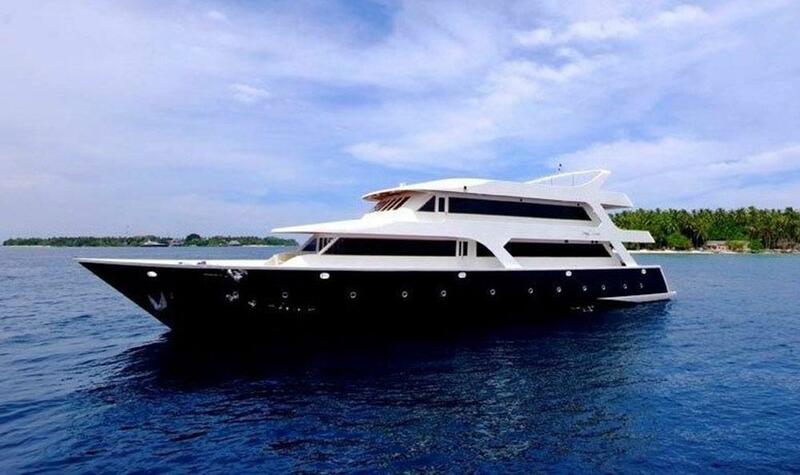 Princess Handy is one of the most popular Maldives diving yachts for a number of reasons. The 36m-long boat is new (2008) and has had a recent refurbishment in 2014. Its large size ensures stability in all sea conditions and it has the perfect blend of luxury and style, being owned and run by an experienced Italian team. In addition, all levels of diver (including non-divers) are welcome to enjoy Maldives scuba diving cruises throughout the year. Trips are usually one week in length and leave and return each Sunday of the Maldives diving season. Solo guests, pairs, couple, families, and groups are all welcome to enjoy some of the best Maldives diving cruises available for the money. 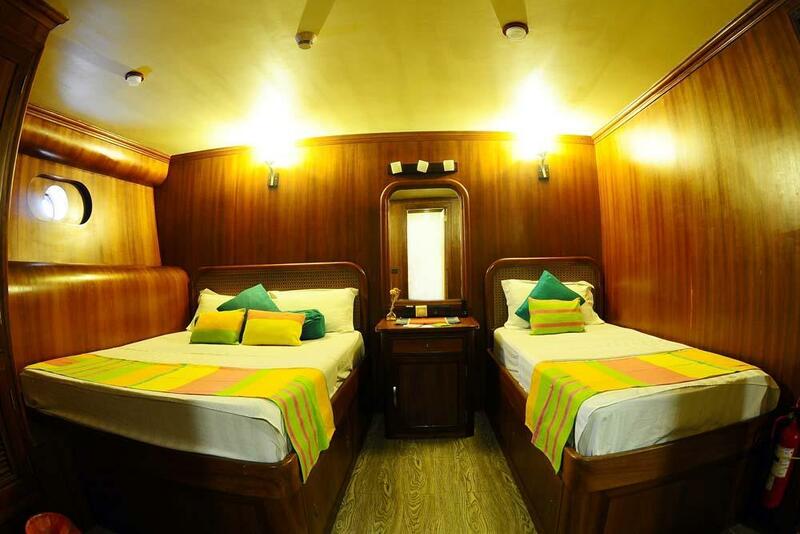 Starting with the boat’s cabins, Princess Handy’s guests can choose from double or twin cabins on the upper or lower decks. 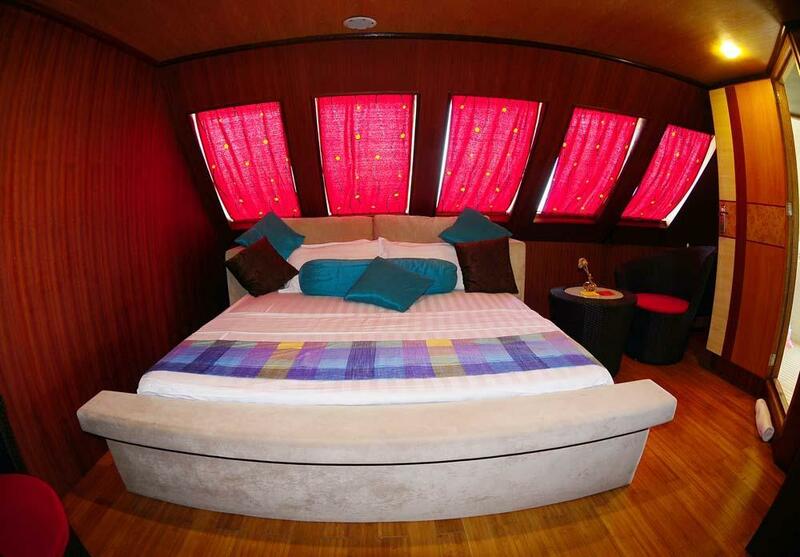 All of the boat’s cabins are fully air conditioned and have private en suite bathrooms with hot & cold showers. They are large, well-appointed and decorated with colourful character. The upper-deck cabins all have double beds, and include one suite. In the lower deck there is a mixture of twins and doubles. Some cabins have an extra bed for families, but the total guest capacity isn’t expanded if three guests stay in one cabin. Handy takes no more than 22 guests per trip. During Maldives diving holidays, comfort and privacy is very important to most guests, and Princess Handy scores well in this department. However, a lot of time is spent on board in communal areas, both inside and out. Princess Handy has large, comfortable areas filled with character to relax both inside and out. 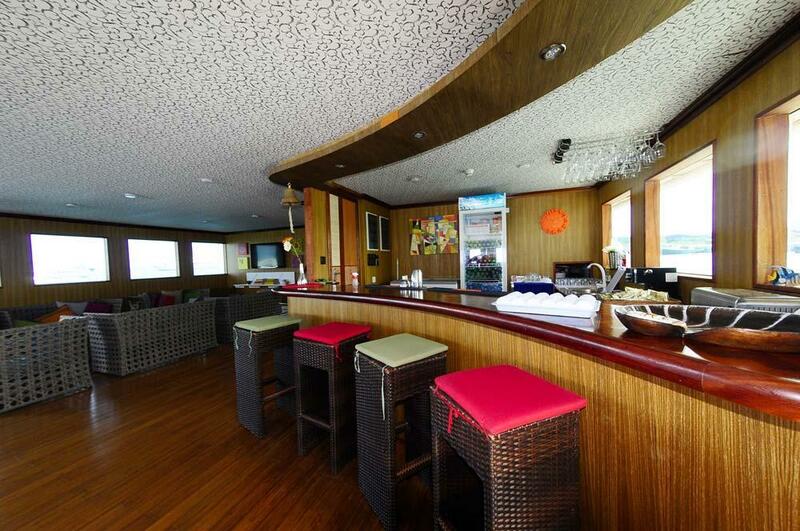 There is a large air-conditioned lounge saloon that has colourful sofas and armchairs, and a bar for drinks. 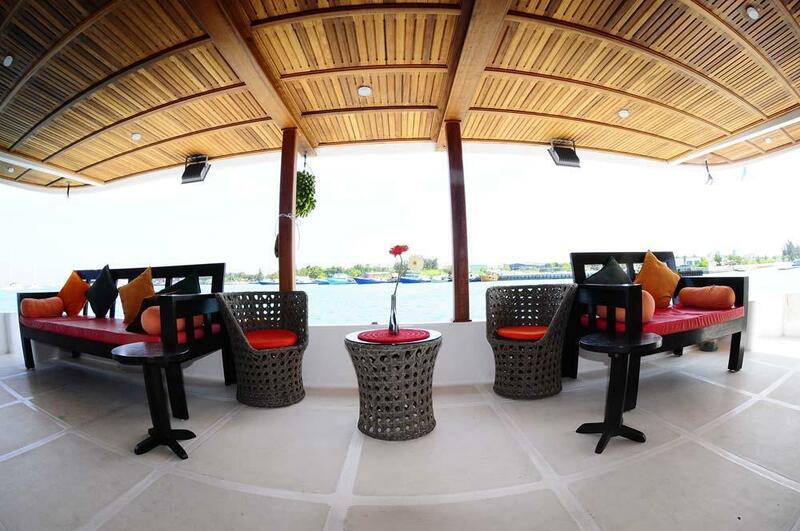 Guests diving Maldives become hungry quickly, and those on Princess Handy can enjoy sumptuous meals and snacks inside and out, depending on the time of day or weather. The boat sails all year round, following the Maldives diving season to always have the best chance to experience the best diving, and the weather in this part of the world is nice all year, anyway. Sun worshippers can choose from Handy’s three sundecks, as well as shaded areas to enjoy the view without getting burnt. There is even a Jacuzzi hot tub. 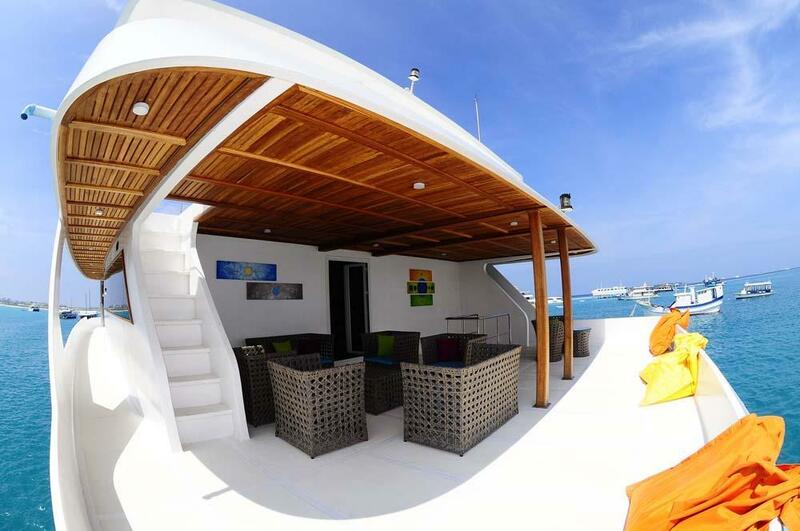 Maldives scuba diving cruises don’t get more luxurious than this. As for diving, to maximise the space on the boat for comfort and to minimise wet floors, the diving takes place from a separate boat, known as a Dhoni. This is a large tender boat that follows Handy and all the equipment is stored on. It is also better for dropping divers off directly above the reef and for picking them up more quickly at the end of each dive. Unlike some other Maldives liveaboard boats, Princess Handy accepts guests of all levels, including those who have never dived before. There are always European staff on each trip to teach diving courses, and they even offer a free ‘introduction dive’ to snorkelling guests. Other courses are also available if booked in advance. Princess Handy also has a small motorized tender that is used for transporting guests to the many pristine beaches on uninhabited islands. Each Maldives scuba diving cruise on Princess Handy starts on a Sunday from Male, but guests are advised to have arrived in The Maldives on the Saturday to settle in and enjoy free transfers from Male airport to the boat from 11.00am-1.00pm on departure Sunday. Guests arriving after 1.00pm need to pay a surcharge for a private transfer. 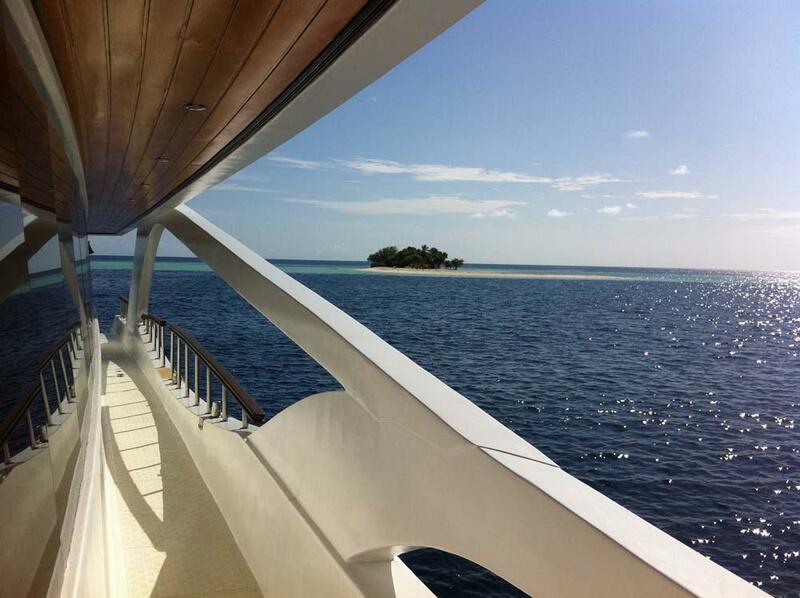 Depending on the time of year, Princess Handy sails to different areas of The Maldives so that the best diving conditions and marine life can be enjoyed. Each day there are two* guided dives, and one night dive per week. *Extra dives are normally possible on request and at a surcharge. Electricity: Desalinization System Of 600 Lt/h, Generator 220 Volts, Stabilised And Super-silent. 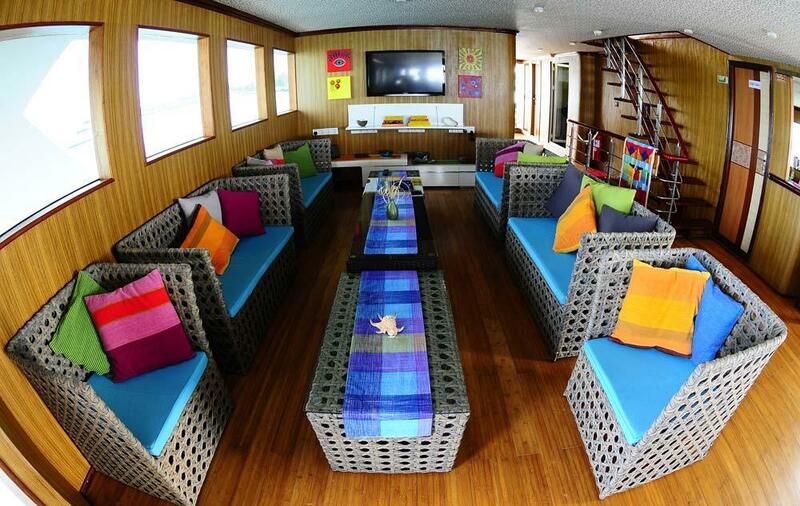 Cabins: 11 Cabins Including 5 Upper-deck Large Doubles, 4 Lower-deck Triples And 2 Lower Deck Doubles. With several European PADI instructors on every cruise, taking part in a PADI diving course on a Maldives diving cruise on board Princess Handy is usually possible. In fact, it’s the ideal time & place to do so. For non-diving guests, there is a free introduction dive available. Adults can take the PADI Open Water Diver course, and even children can learn to dive. One of the most popular courses is the AOW (Advanced Open Water) course which increases & improves each diver’s skills & experience. Please contact us in advance if you would like to take a diving course on Princess Handy. Free scheduled transfers from & back to the Male airport and local hotels on departure and return dates. Please note that the free pick up is 11.00-13.00 on departure day. Guests arriving after 13.00 (1pm) will need to pay a surcharge for a private transfer.